Cookies & Cream pulled back into a tie for second place in the season standings by defeating Eastbound & Dahn 10-7, thanks in large part to a nine-run bottom of the third on 8 consecutive hits that created an insurmountable deficit for Eastbound. 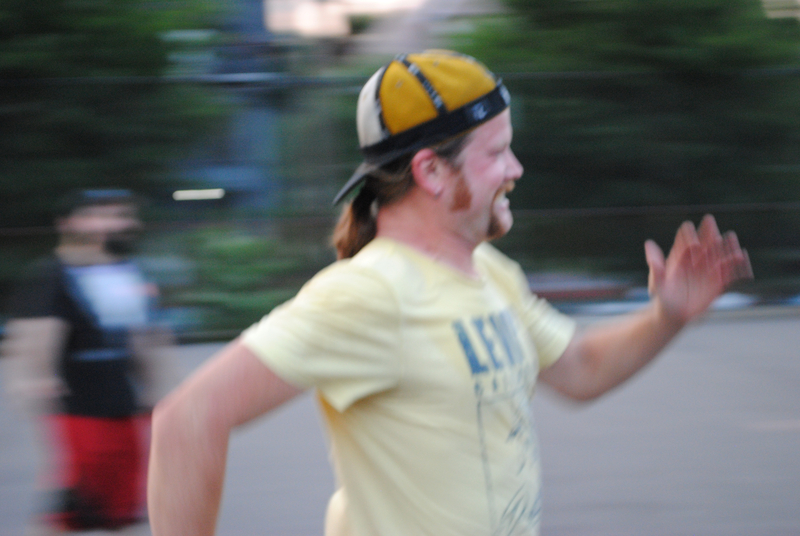 With Guthrie remaining out of the lineup, Joey started for Cookies & Cream, and he gave up an early lead to Eastbound. After retiring Christian to start the game, he gave up an inside-the-park homer to Nate, as Eastbound jumped ahead 1-0. Joey then retired Morrison to end the inning. Cookies would even things up in the bottom of the first. Joey led off the game with a triple off Eastbound’s starter, Helal, and scored on a Blose ground-out to tie the game at 1-1. Helal then retired Dinger to avoid further damage, and the game was tied through the first inning. Tim led off the top of the second with a double, but Joey was able to strand him, retiring the next two batters to end the inning. Helal retired Cookies in order in the bottom of the second, and the score remained 1-1. Eastbound pulled ahead in the top of the third with the help of some Cookies & Cream fielding errors. Joey retired Nate to start the inning, but the next two batters, Morrison and Tim, each singled to put runners on first and second with one out. Helal came to the plate and launched a three-run blast to right field, and Eastbound led 4-1. Ahead by three runs, Helal and Eastbound were looking good until Cookies unleashed a nine-run onslaught in the bottom of the third. Blose led off the inning with a solo homer, making the score 4-2. Dinger singled, and Helal retired the next batter, Dustin, for the first out of the inning. Cookies would then string together eight consecutive hits before Helal retired his next batter. Joey singled to put runners on first and third, and BLose hit a bases-clearing triple to tie the game at 4-4. Dinger followed with a single, and Dustin got his first career EWL hit and homer, a three-run bomb that put Cookies & Cream ahead 7-4. Joey followed with a homer, and the back-to-back jacks made the score 8-4. Blose doubled for the second time in the inning, and Dinger followed with an RBI double, extending the Cookies lead to 9-4. Dustin then tripled, scoring Blose to make the score 10-4. Helal finally retired Joey to end the inning, but Cookies went from trailing by three runs to leading by six through three innings. Eastbound made up some ground in the top of the fourth, starting when Nate led off the inning with a solo shot to cut the score to 10-5. Two batters later, Tim launched a homer to right-center, and the score was 10-6. Helal followed with a single, but Joey stranded him to end the inning. An inning after getting pummeled, Helal returned to form, pitching a scoreless bottom of the fourth. Morrison hit a one-out double in the top of the fifth, but Eastbound couldn’t cut into the four-run deficit, as Joey stranded the runner to end the inning. Blose hit a one-out double in the bottom of the fifth, but Helal matched Joey, stranding the runner. Down 10-6, Helal provided his own run support in the top of the sixth. He led off the inning with a solo homer, his second of the game, which cut the score to 10-7. Cookies removed Joey from the mound and turned to their closer, Blose, to collect the final two outs. He struck out the first batter he faced, Christian, and followed by getting Nate to hit a lazy fly ball to the mound for the second out of the inning. Cookies & Cream held on to win 10-7, drawing them even with Eastbound at 7-5 in second place in the standings. – Joey earned the win for Cookies & Cream, giving up 7 earned runs on 10 hits in 5 innings pitched. – Blose pitched one inning of scoreless and hitless relief, striking out one and collecting his third save of the season. – Helal took the loss for Eastbound, allowing 10 runs on 13 hits in 5 innings pitched. – Blose led Cookies at the plate, going 4-for-6 with 3 doubles, a home run, 3 runs scored, and 3 RBI. – Helal led Eastbound & Dahn on offense, going 3-for-4 with a single, 2 homers, 2 runs scored, and 4 RBI. 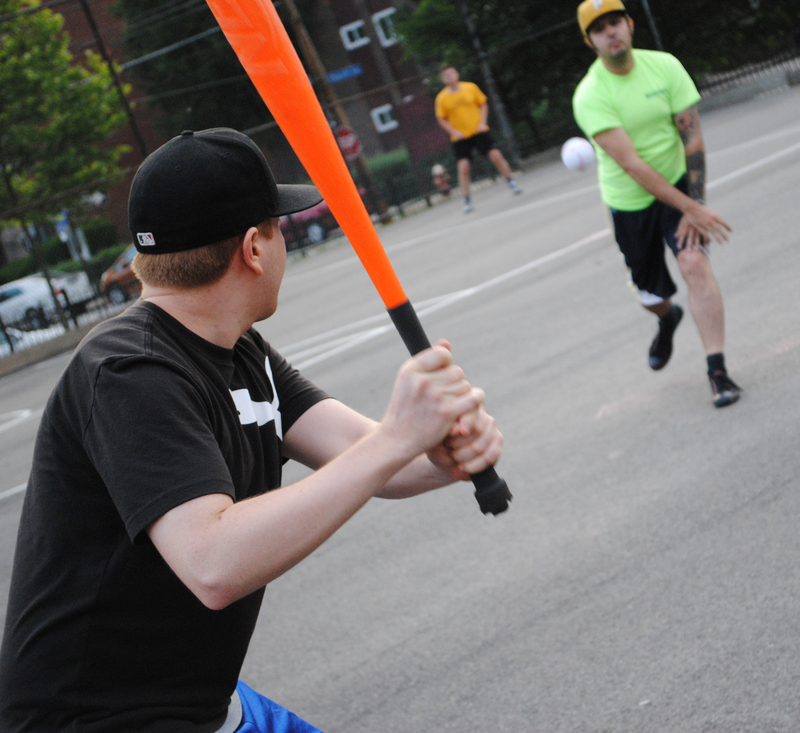 Christian went 3-for-3 and was a double short of the cycle as Eastbound & Dahn put out a late Questionable Outfit comeback attempt to win 5-4 and move closer to Questionable in the season standings. Nate took the mound for Eastbound & Dahn, and he was very effective early, retiring Bob and Tom in order in the top of the first. Mike started for Questionable Outfit, and he matched Nate’s top of the first with a perfect frame in the bottom of the inning, as the game was scoreless through one. Reilly led off the top of the second with a double, but Nate stranded him, retiring the next two batters to maintain the scoreless tie. Eastbound got to work in the bottom of the second, providing Nate with run support and taking an early lead. Christian led off the inning with a single and moved to second when Helal followed with a single, and both runners advanced a base when Nate grounded out for the first out of the inning. The next batter, Morrison, crushed a three-run bomb to left, and Eastbound & Dahn led 3-0. Mike retired the next batter to end the inning, and Questionable trailed by three runs. After retiring Tom for the first out in the top of the third, Nate gave up a solo homer to Reilly, and the score was 3-1. Mike followed with a single, but Nate stranded him to end the inning, holding on to a two-run lead. Eastbound immediately made up for the run in the bottom of the third when Christian led off with a solo homer to right, putting Eastbound ahead 4-1. 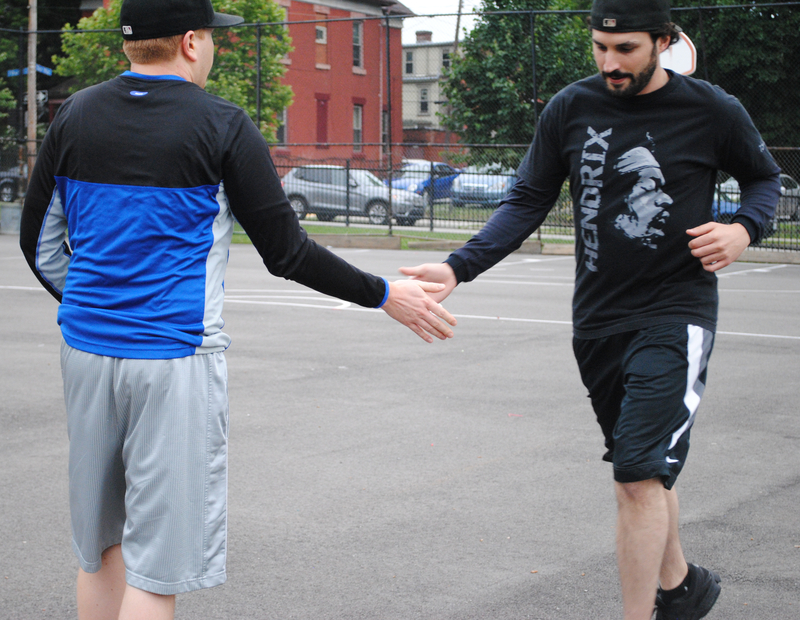 Mike then retired Helal and fanned Nate to end the inning. Nate pitched a scoreless inning in the top of the fourth, and Eastbound would add a little more run support in the bottom of the inning. Morrison led off the inning with a double, and Christian later followed with an RBI triple, scoring Morrison to make the score 5-1. Reilly retired Helal to strand Christian at third, and Eastbound led by four runs heading into the fifth. Questionable finally got their bats out in the top of the fifth, cutting into the Eastbound lead. Mike led off the inning with a single, and Bob followed with a two-run bomb, cutting the deficit to 5-3. Tom followed with a solo shot, and the score was 5-4. It looked as if Questionable would rally and take the lead, however, Nate was able to escape the inning without further damage, maintaining a narrow lead. Reilly retired the side in order in the bottom of the fifth, and Questionable trailed 5-4 heading into the top of the sixth. A game after rallying in their final at-bat to tie the game and later win in extras, Questionable couldn’t summon the same magic against Eastbound. Nate retired Tom and Reilly consecutively to end the inning and the game, and Eastbound held on to win 5-4. 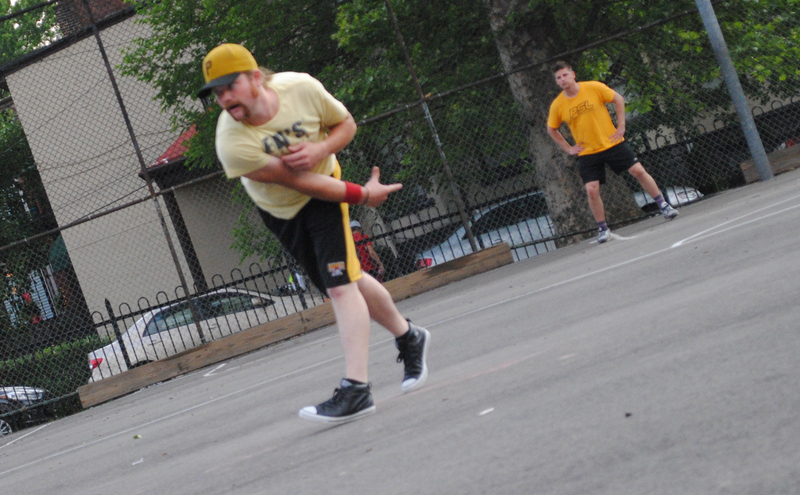 The win moved Eastbound & Dahn to 7-4 on the year, and the loss dropped Questionable Outfit to 8-4 with a half-game lead atop the season standings. – Nate pitched the complete game win for Eastbound, giving up 4 runs on 7 hits in 6 innings. – Mike suffered the loss for Questionable, allowing 5 runs on 6 hits while striking out one in 5 innings. – Christian led Eastbound on offense, going 3-for-3 with a single, a triple, a homer, 2 runs scored, and 2 RBI. – Morrison also went 2-for-4 with a double, a homer, 2 runs scored, and 3 RBI. 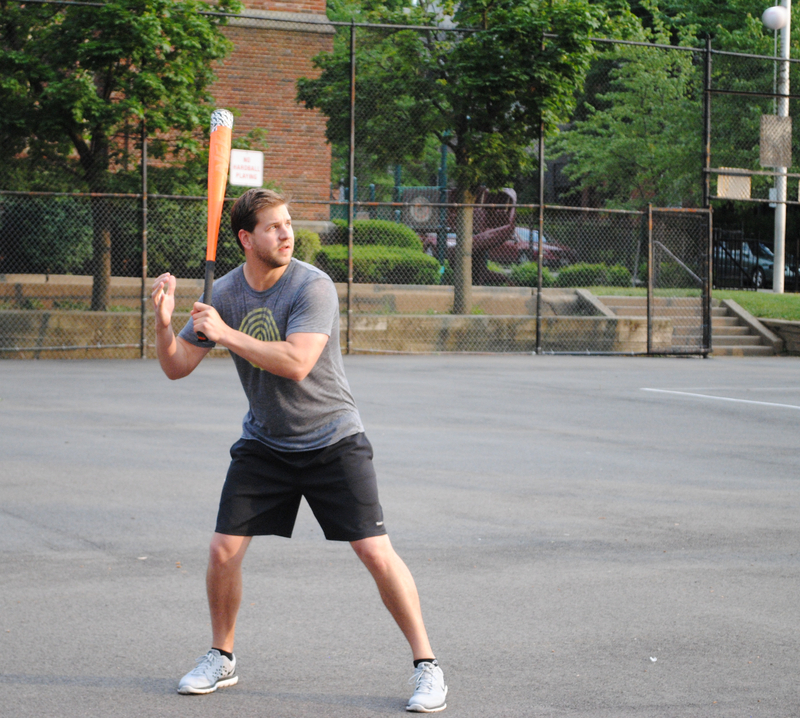 – Mike led Questionable Outfit on offense, going 3-for-4 with 3 singles and a run scored. – Bob, Tom and Reilly each hit a home run for Questionable. Charlie had what may have been the best outing of his EWL career against Cookies & Cream, allowing a single run on 3 hits as the Ham Slams bounced back from a disappointing loss against Questionable Outfit to beat Cookies 4-1. Charlie had struggled mightily on the mound in 2015 heading into this outing, and it looked like he was going to get into trouble again against Cookies in the top of the first. Joey led off the game with a double, and two batters later, Dinger delivered an RBI single to put Cookies ahead 1-0. Charlie retired the next batter, Dustin, to end the inning. Charlie would retire 10 of the next 11 hitters he faced, allowing only one more hit the entirety of the game. The Slams evened things up in the bottom of the first, starting when Tim led off the inning with a triple due to a fielding error by Joey in center. The next batter, Adam, grounded out, but Tim scored on the play to tie the game at 1-1. Dinger, Cookies & Cream’s starter, then retired Alan to end the inning with the game tied. Charlie cruised through the top of the second, and the Slams would take the lead for good in the bottom half of the inning. Steve led off the inning with a solo shot to right-center, and the Ham Slams led 2-1. Tim followed with a double, and he moved to third on an Adam single, putting runners on the corners with no outs. The Slams couldn’t capitalize, as Dinger got Alan and Steve to fly out consecutively, stranding both runners. Down 2-1, Cookies struggled to generate offense, as Charlie retired Dinger and Dustin consecutively. The Slams extended their lead in the bottom of the third. Adam singled with one out, and Alan followed with a two-run homer, as the Slams took a 4-1 lead. Steve followed with a single, but Dinger stranded him to end the inning. The Ham Slams had taken a three-run lead, and it would be all they needed in this one. Charlie continued to dominate in the top of the fourth, retiring the side in order. Dinger matched him in the bottom of the fourth, and the score remained 4-1. Cookies & Cream failed to register a hit in the top of the fifth, and Charlie had pitched four consecutive perfect frames. 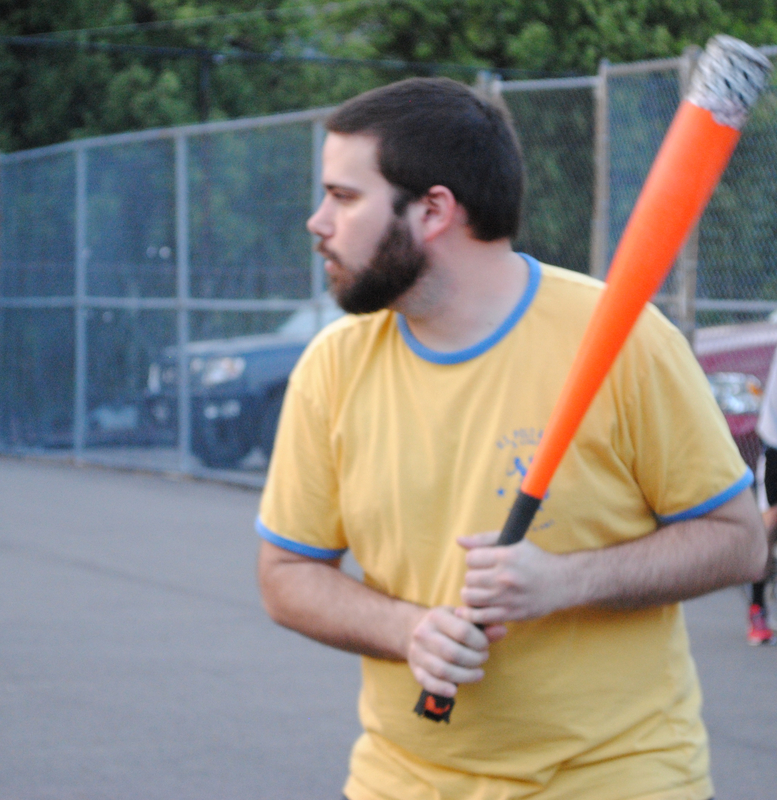 Dinger did the same in the bottom half, and Cookies & Cream came into their final at-bat trailing by three runs. Charlie retired Joey for the first out of the inning, and Blose came to the plate hitless in three at-bats and in danger of snapping his league-record active hitting streak. Cookies hadn’t reached base safely since the first inning, but Blose was able to lace a single off the wall, extending his hitting streak and the game for Cookies. But Charlie cracked down, retiring Dinger to strand the runner and end the game, giving Ham Slams a 4-1 win. 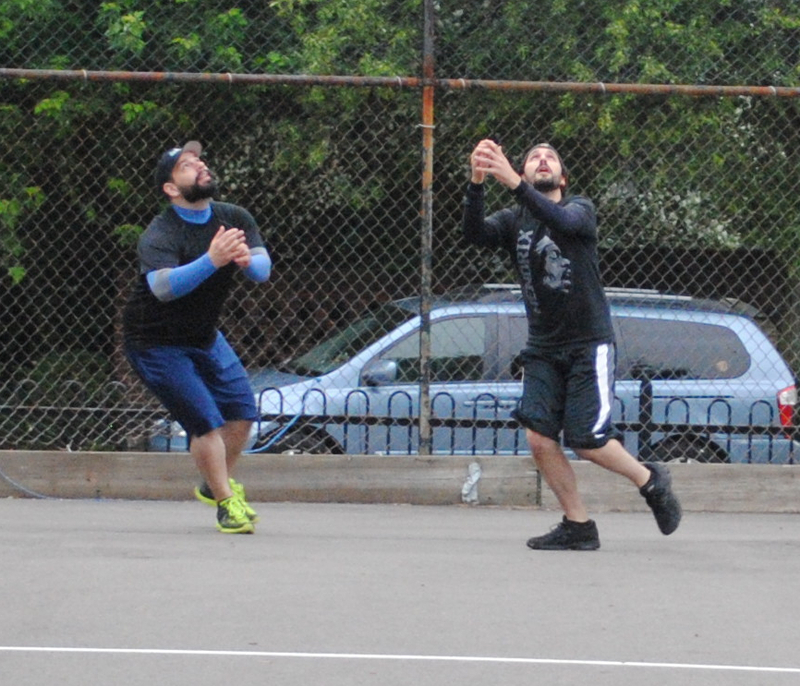 The win moved the Slams to 2-10 on the year, while the loss dropped Cookies & Cream to 6-5. – Charlie pitched the complete game win for the Ham Slams, scattering 3 hits and a single earned run in 6 innings. It was his first win in 8 decisions in 2015. – Dinger took the loss for Cookies & Cream, giving up 4 runs on 7 hits in 5 innings pitched. 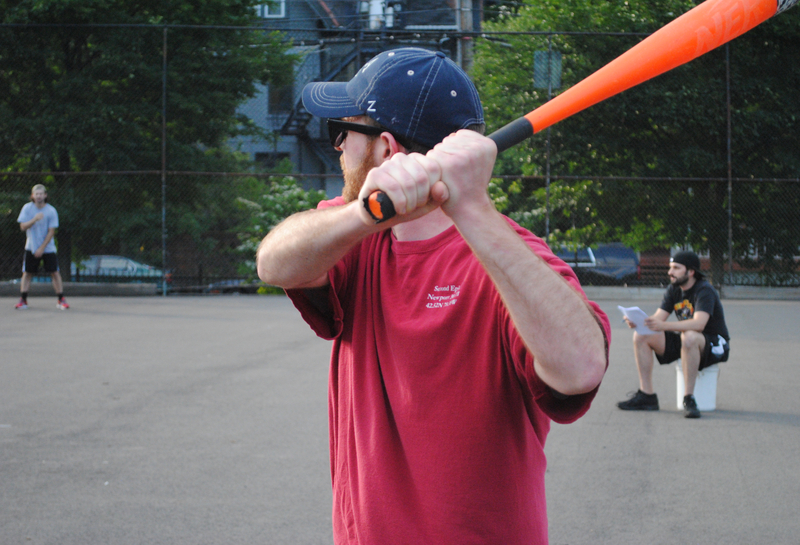 – No member of the Ham Slams had a particularly great game on offense, but Tim, Adam, and Steve each collected two hits. – Joey, Blose, and Dinger each registered one base hit against Charlie. 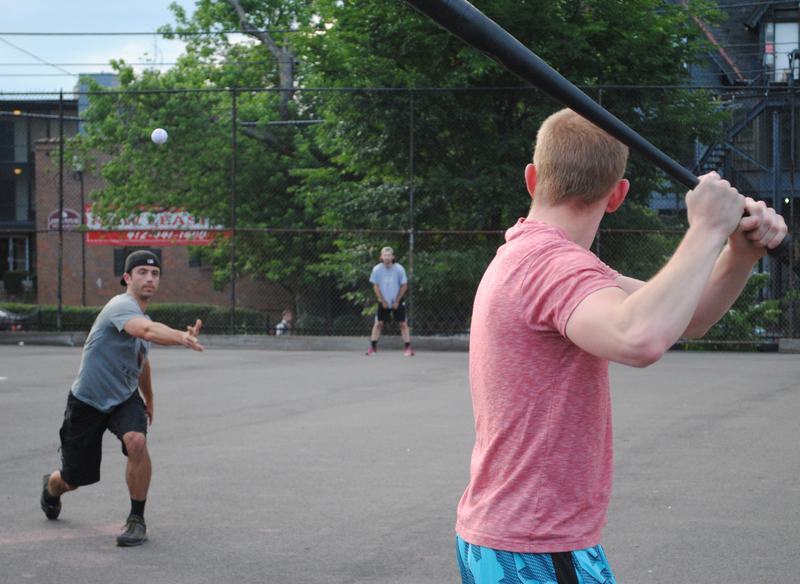 Despite trailing late, Questionable Outfit worked their magic at the plate, scoring four runs in the final two innings, as Reilly’s walk-off two-run homer in the bottom of the seventh inning gave Questionable a 10-8 victory over the Slams. Reilly started on the mound for Questionable Outfit, and the Ham Slams got to him early to take an early lead. Tim led off the game with a single, and two batters later he scored from second when Alan hit an RBI single to make the score 1-0. Questionable would even things up in the bottom of the first. Tim, the Ham Slams starter, retired Bob for the first out of the inning. But the next batter, Tom, crushed a solo shot to left-center, tying the game at 1-1. Reilly followed with a double, but Tim retired Mike to strand the runner and end the inning. Reilly pitched a scoreless frame in the top of the second, and Tim matched him in the bottom half of the inning, as the score remained tied at 1-1. Alan led off the top of the third with a solo homer, putting the Slams up 2-1. 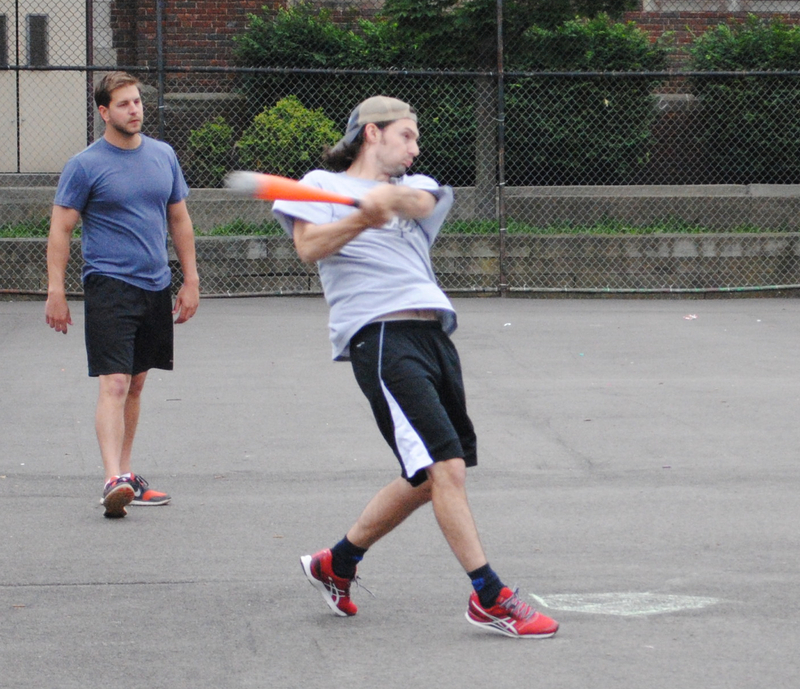 After retiring Steve, Reilly gave up another homer, this time to Tim, which made the score 3-1. 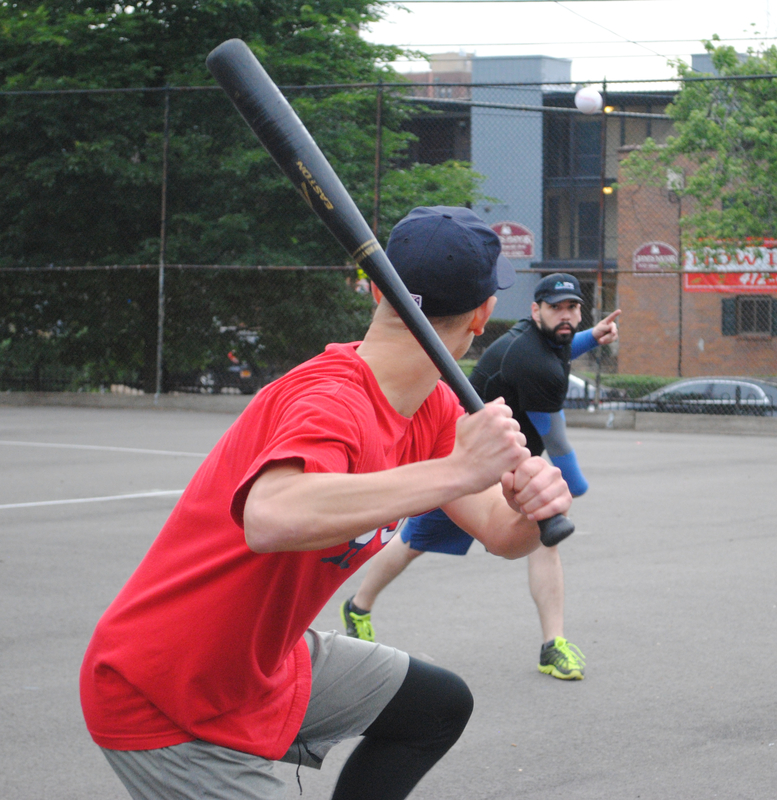 The Slams had taken a two-run lead, but Questionable fired back in the bottom of the third. Mike led off the inning with a single, and Bob followed with a two-run bomb that tied the game at 3-3. Later in the inning, Reilly hit a solo homer, putting Questionable Outfit ahead 4-3 through three innings. The Ham Slams bounced right back in the top of the fourth when Steve hit a one-out solo homer, tying the game at 4-4. Tim gave up a leadoff double to Bob in the bottom of the fourth, but stranded the runner to maintain the tie. The Slams had what may have been their best inning of the 2015 season in the top of the fifth, surging to a four-run lead. Adam led off the inning with a single, and two batters later Steve crushed a two-run shot to right field, putting the Slams ahead 6-4. The next batter, Tim, tripled, and Adam followed with another two-run homer. 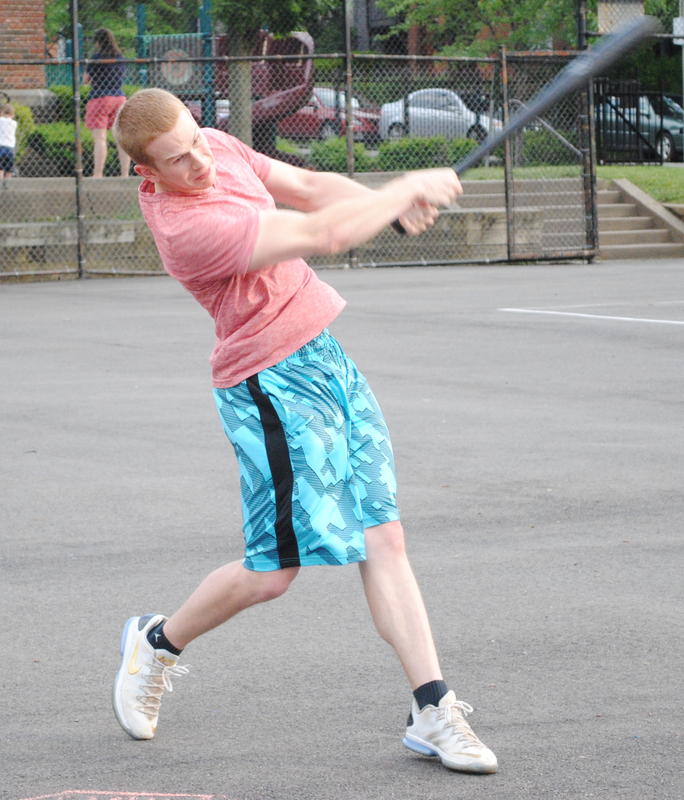 Reilly then retired Alan, but the Slams had pulled ahead 8-4. Questionable Outfit would cut the Ham Slams lead in half in the bottom of the fifth. Mike led off the inning with a solo homer, making the score 8-5. Bob followed with a double, and he moved from second to third on a Tom sacrifice fly. With one out, Reilly singled to left-center, scoring Bob to cut the deficit to 8-6. Mike followed with a single, and Questionable Outfit had runners on first and second with one out and Bob coming to the plate. Tim, however, buckled down and retired Bob to strand both runners and end the inning. The Slams couldn’t add to their lead in the top of the sixth. Tim hit a one-out double, but Reilly stranded him, and the score remained 8-6 with Questionable heading into their final at-bat. Tom led off the bottom of the sixth with a solo homer, his second of the game, and with one swing Questionable had pulled within a run at 8-7. Tim retired Reilly for the first out of the inning, and the Slams were an out away from topping Questionable for the first time since 2013. However, Mike came to the plate, and he delivered the most clutch hit of 2015 so far, blasting a solo homer to left-center, tying the game at 8-8 and giving Questionable a chance to put the game away with Bob on deck. Tim had kept Bob in check throughout the game, and he continued to do so, retiring him for the second out of the inning, sending the game to extras. Tom prepares to catch a pitch he doesn’t like. He had 2 doubles, 2 homers, and 2 RBI in the game. 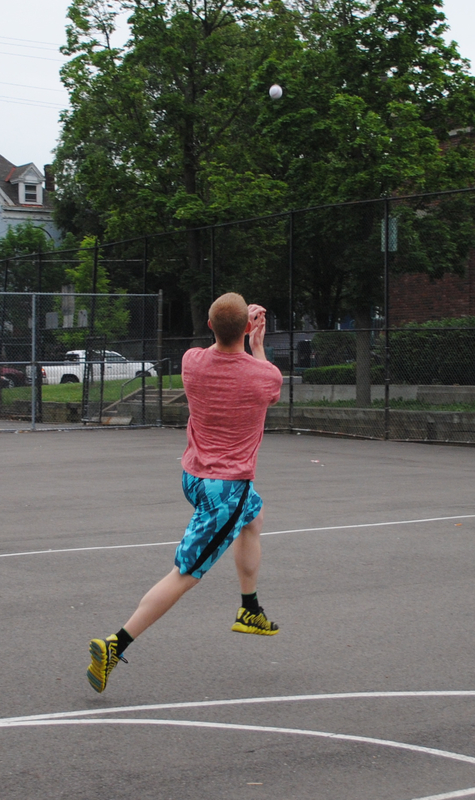 Reilly remained in the game for Questionable Outfit, and he retired the Ham Slams in order in the top of the seventh. Tom led off the bottom of the seventh with a high fly ball to left that fell in due to a fielding error, putting him on second base with a double. The error proved meaningless, however, as the next batter, Reilly, crushed a two-run blast, his second homer of the game, and the walk-off home run gave Questionable Outfit a 10-8 extra-innings victory. 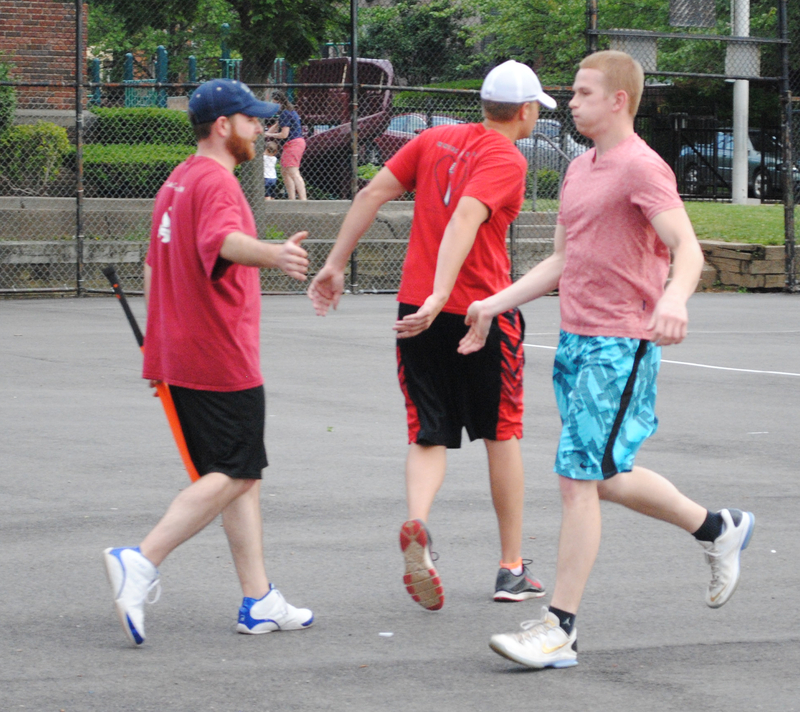 The win moved Questionable Outfit to 8-3 on the season as they remained in first place. The loss dropped the Ham Slams to 1-10. – Reilly pitched the complete game victory for Questionable Outfit, allowing 8 runs on 10 hits in 7 innings pitched. 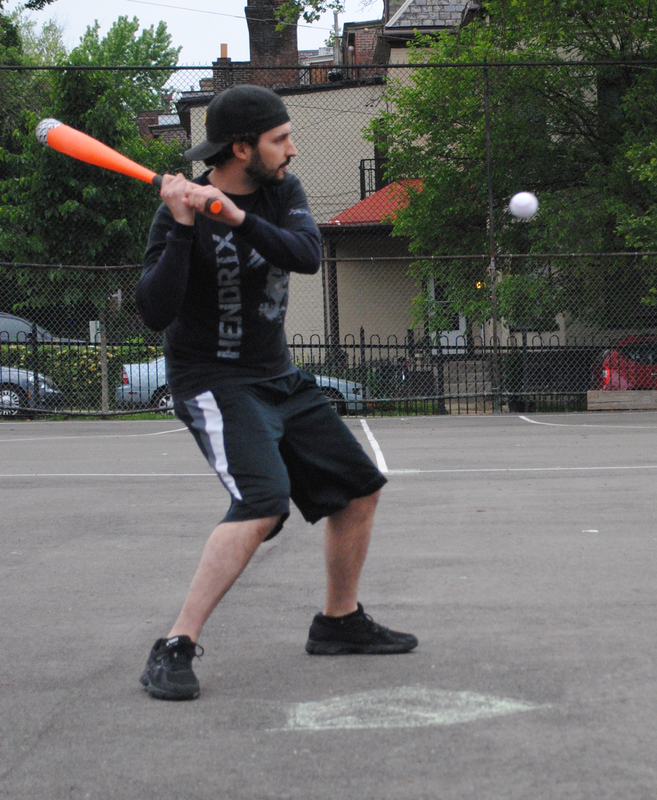 – Tim took the loss for the Ham Slams, giving up 10 runs on 15 hits in 6 innings pitched. – Mike led Questionable Outfit on offense, going 4-for-6 with 2 singles, 2 home runs, 3 runs scored, 2 RBI, and the game-tying homer in the bottom of the sixth. – Reilly’s walk-off was the first in 2015 for any player, and the first since Dinger’s walk-off nearly a year ago on June 24th of 2014 (the only walk-off in 2014). – Tim became the first Ham Slam to hit for the cycle in 2015, going 4-for-6 with a single, a double, a triple, a home run, 3 runs scored, and an RBI. It was his first career cycle. 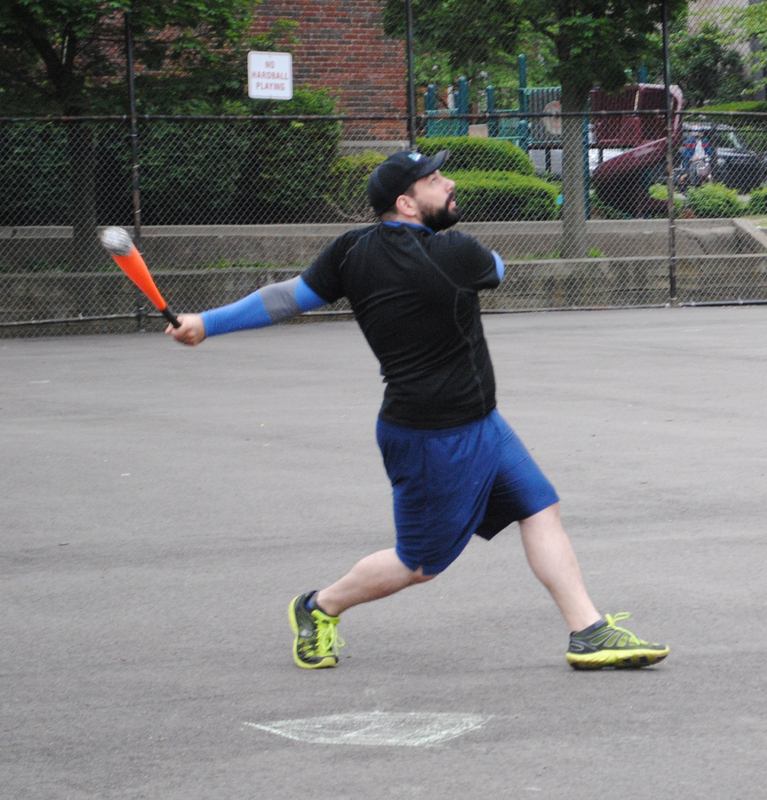 In one of the most lopsided games in EWL history, Cookies & Cream hit 11 home runs, including three different players with three home runs each, en route to a 21-4 demolition of Eastbound & Dahn. Joey started on the mound for Cookies & Cream, and he allowed Eastbound to take an early lead in the top of the first. With one out, Tim crushed a solo shot to deep right-center, and Eastbound was up 1-0. Cookies & Cream took the lead back quickly in the bottom of the first. Joey started the game by providing his own run support, hitting a leadoff homer that tied the game at 1-1. Blose followed with a solo shot of his own, and the back-to-back homers put Cookies ahead 2-1. Vassallo later hit a one-out double, but Christian, Eastbound’s starter, stranded him to end the inning. Down a run, Eastbound evened the score in the top of the second. With one out, Nate hit a solo homer to left-center, tying the game at 2-2. Cookies bounced back in the bottom of the second, taking the lead for a second time. Dinger hit a one-out double, and Vassallo drove him in with an RBI single to make the score 3-2 Cookies. Joey pitched a perfect frame in the top of the third, retiring the side in order. Cookies extended their lead in the bottom of the third, starting with Blose, who led off with his second homer of the game to make the score 4-2. Dinger followed with a homer, putting Cookies in front 5-2. Two batters later, Joey hit Cookies third solo home run of the inning, making the score 6-2. Tim hit a one-out double in the top of the fourth, but Eastbound couldn’t capitalize, and they continued to trail by four runs. Cookies & Cream blew the game open in the bottom of the fourth. Dinger started the inning with a solo homer and after a Vassallo single, Joey hit a two-run shot which gave Cookies a 9-2 lead. Blose then singled, and Vassallo hit a one-out double to push the score to 10-2. Joey followed with an RBI double to score Vassallo, and Cookies had taken an 11-2 lead through four innings. Joey pitched another scoreless inning in the top of the fifth, and Cookies & Cream would turn the game into a rout in the bottom of the fifth. Dinger started the inning with his third homer of the game, making the score 12-2. Vassallo followed with a home run, and the back-to-back jacks extended the Cookies lead to 13-2. After Joey doubled, Blose hit his third homer of the game. With the score 15-2, Dinger tripled, and Vassallo drove him in with his second blast of the inning, which made the score 17-2. Eastbound had yet to record an out when Joey doubled and moved to second on a Blose single. With runners on the corners, Dinger doubled, scoring both runs to make the score 19-2. Christian finally retired Vassallo for the first out of the inning, but Joey followed with an RBI double to score Dinger, and Cookies led 20-2. Blose then doubled, scoring Joey. Dinger was finally retired for the second out of the innning, but Cookies had piled 10 additional runs onto their lead, and were ahead by 19 runs entering the sixth. Eastbound would score a few runs in the top of the sixth, but the deficit was insurmountable. Tim led off the inning with his second homer of the game, which made the score 21-3. Two batters later, Helal got his first hit of the game, a solo homer, cutting the score to 21-4. Joey then retired Nate for the second out of the inning, giving Cookies & Cream one of the largest margins of victory in league history. The win moved Cookies & Cream into a tie for second place at 6-4. 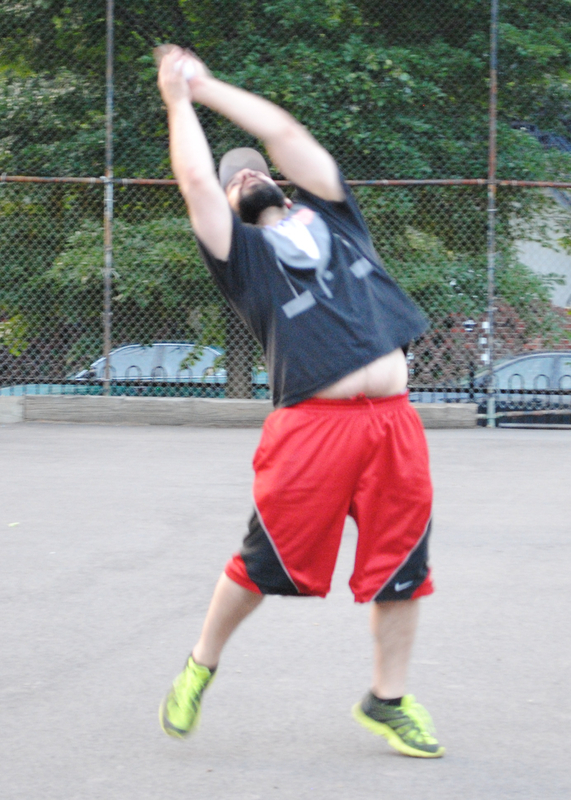 Eastbound & Dahn dropped to 6-4 on the year, tied with Cookies for second at the halfway mark in the regular season. – Joey pitched the complete game win for Cookies & Cream, scattering 4 runs on 5 hits in 6 innings pitched. – Christian took the loss for Eastbound, allowing 21 earned runs on 25 hits in 5 innings pitched. – Dinger hit for the cycle for Cookies & Cream, going 6-for-9 with a single, a double, a triple, 3 home runs, 6 runs scored, and 5 RBI. – Joey led Cookies at the plate, going 7-for-9 with 4 doubles, 2 homers, 6 runs scored, and 6 RBI. 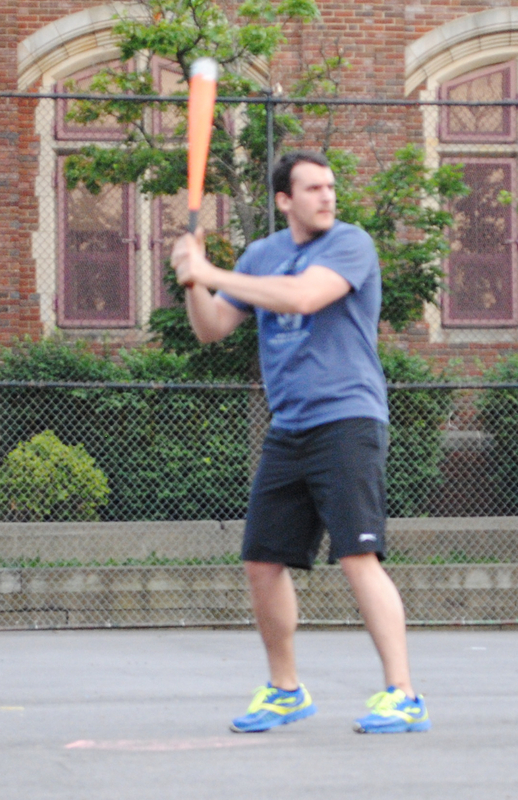 – Blose also had a monster game for Cookies, going 6-for-9 with 2 singles, a double, 3 homers, 5 runs scored, and 5 RBI. – Tim led Eastbound on offense, going 3-for-4 with a double, 2 home runs, 2 runs scored, and 2 RBI. 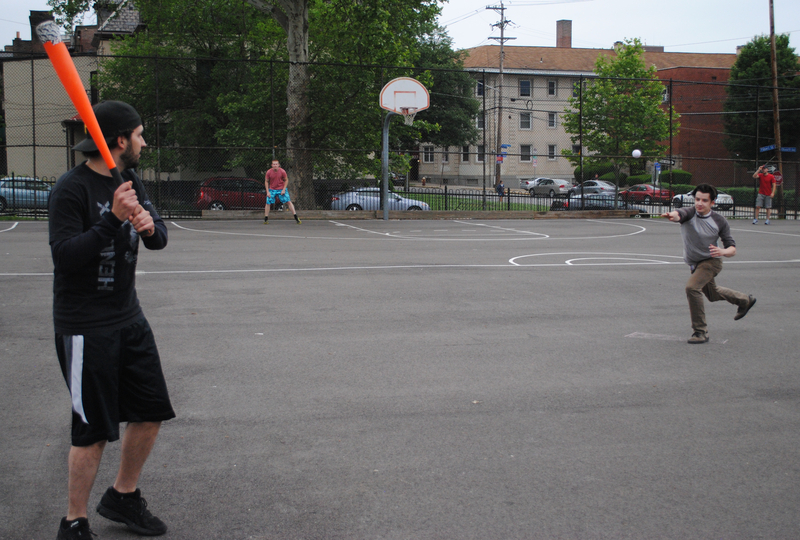 Questionable Outfit hit 10 homers, with Bob contributing 4 of them, in an easy 13-7 victory over Eastbound & Dahn. The win put Questionable Outfit in a familiar place, first place, after falling behind Eastbound in previous weeks. The loss dropped Eastbound into a potential tie for second and the season’s midway point. 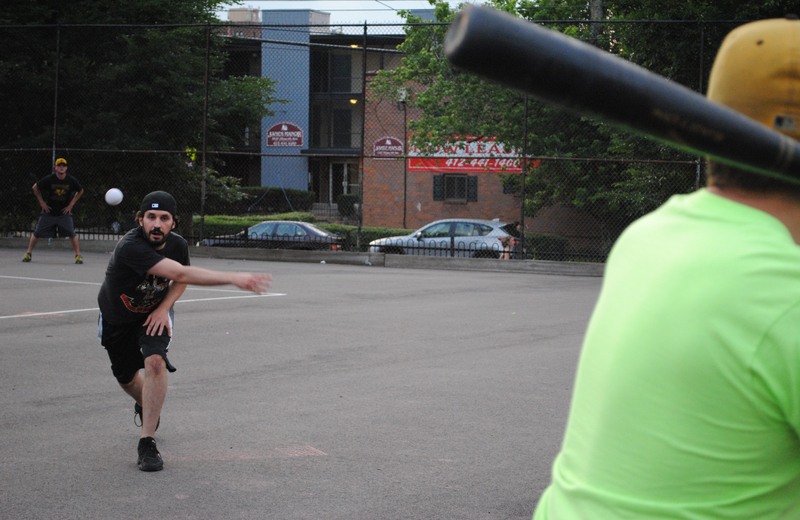 After a solid performance against the Ham Slams earlier in week 5, Mike started on the mound for Questionable. The game’s first batter, Nate, crushed a leadoff homer to left-center, putting Eastbound ahead 1-0. Mike stopped the bleeding there, retiring the next two batters. Helal started for Eastbound, hoping to continue his hot start to the 2015 season. Bob led off the bottom of the first with a double and scored on a Tom groundout to deep left to tie the game at 1-1. Helal then retired Reilly to end the inning. Eastbound reclaimed the lead in the top of the second, starting when Helal provided his own run support with a solo homer to make the score 2-1. Two batters later, Tim hit a solo shot, and Eastbound led 3-1. Down 3-1, Bob hit a one-out solo homer in the bottom of the second, cutting the score to 3-2. Tom followed with a triple, but Helal maintained the lead, retiring Reilly to strand the runner. Out of eligibility, Mike was removed from the mound and replaced with staff ace Reilly. The first batter he faced, Nate, doubled off the fence, and Tim followed with a two-run blast to left-center, putting Eastbound ahead 5-2. Christian followed with a single, but Reilly stranded him, striking out Helal and retiring Nate to end the inning. Down three runs, Questionable got out their bats in the bottom of the third and took their first lead of the game. Mike started the inning with a solo homer that cut the score to 5-3. Bob followed with a solo shot, his second of the game, and the lead was cut to 5-4. Tom then doubled and scored when Reilly hit a two-run homer, putting Questionable ahead 6-5. Mike would then hit his second homer of the inning, and Questionable had scored five fast runs to take a 7-5 lead through three innings. Tom connects on one of his two homers. He also had a double and a triple in the Questionable Outfit win. After scoring in each of the first three innings, the Eastbound bats went silent in the fourth, as Reilly retired the side in order. Questionable got back to work in the bottom of the fourth, and put the game out of hand with a six-run inning. Helal retired Reilly for the first out of the inning, and then the wheels fell off. Mike doubled, and Bob crushed his third homer of the game, a two-run shot that made the score 9-5. 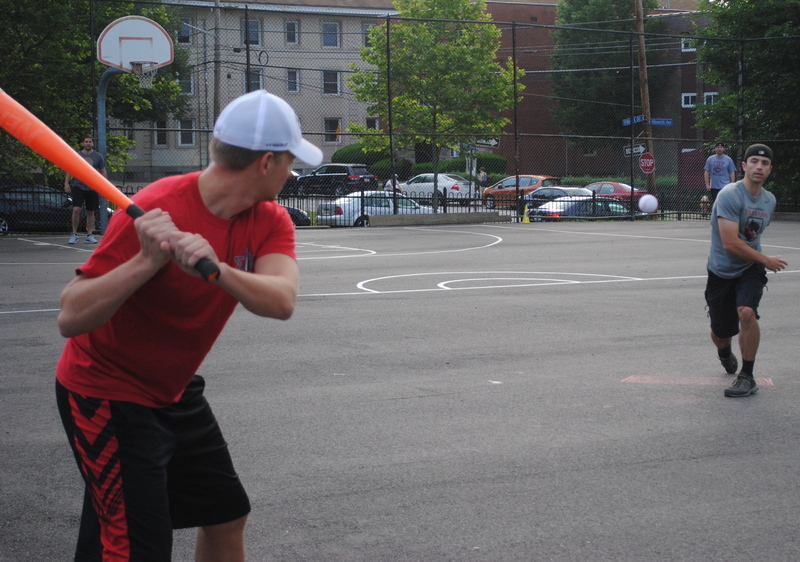 Tom and Reilly each followed with solo homers, and the three consecutive blasts gave Questionable Outfit an 11-5 lead. Mike then doubled, and Bob blasted his second homer of the inning and fourth of the game, extending the lead to 13-5. Tom followed with a solo shot, Questionable Outfit’s fifth home run of the inning, and the lead was ten runs at 15-5. Helal was finally removed from the game and replaced on the mound by Christian. Christian gave up a single to Reilly before retiring Mike to end the onslaught. Down ten, Eastbound would put a small dent in the Questionable lead in the top of the fifth. Helal singled with one out, and Nate followed with a two-run bomb, his second homer in the game, and the score was 13-7. The inning ended there, however, and Questionable led by six. Christian retired the side in order in the bottom of the fifth, which was Questionable’s first inning without scoring. Down six heading into the top of the sixth, Eastbound would need a miracle. Reilly, however, shut the door, retiring Christian and Helal consecutively to end the game. The win moved Questionable Outfit to 7-3, into sole possession of first place at the break, and leading the pace toward what would be their third consecutive EWL pennant. 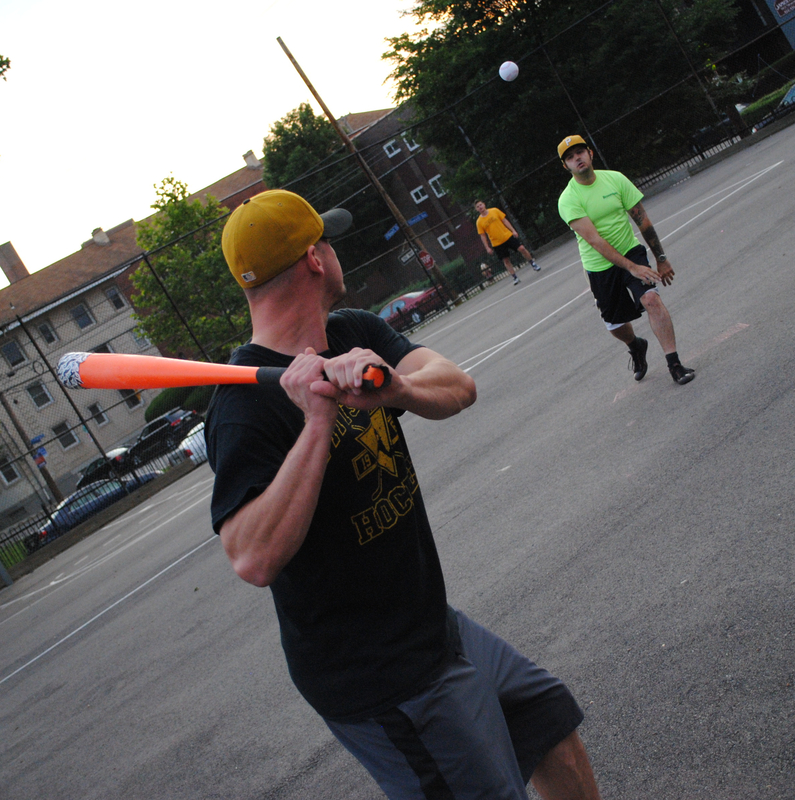 The loss dropped Eastbound & Dahn out of first place and into a 6-3 record. – Reilly picked up the win in relief for Questionable Outfit, giving up 4 runs on 5 hits while striking out one in 4 innings. Mike took the no-decision after starting the first 2 innings, allowing 3 runs on 3 hits. – Helal took the loss for Eastbound, allowing 13 runs on 15 hits in 3.5 innings. Christian pitched 1.5 innings of relief, allowing 1 hit and no earned runs. 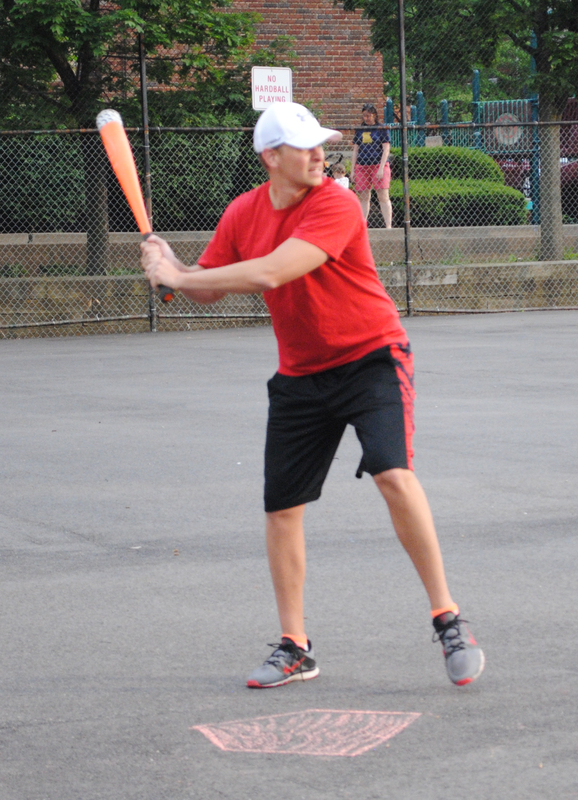 – Bob led Questionable Outfit on offense, going 5-for-7 with a double, 4 home runs, 5 runs scored, and 5 RBI. – Reilly, Tom, and Mike also each hit two home runs in the game. – Nate led Eastbound & Dahn at the plate, going 3-for-5 with a double, 2 home runs, 3 runs scored, and 3 RBI. Tim also hit 2 homers for Eastbound. Cookies & Cream outscored the Ham Slams 21-14 in the most prolific display of offense in the history of the Ellsworth Wiffleball League. The teams combined for 35 runs on 16 home runs in what was also the longest game, in terms of duration, that the league has ever seen. Dinger started on the mound for Cookies & Cream, and remarkably, he retired the game’s first two batters in order. Cookies & Cream provided him with immediate run support, hitting Charlie early and often. Joey led off the bottom of the first with a solo homer, making the score 1-0. With one out, Dinger went deep, and Vassallo followed with a home run. The back-to-back home runs put Cookies & Cream ahead 3-0 after the first. 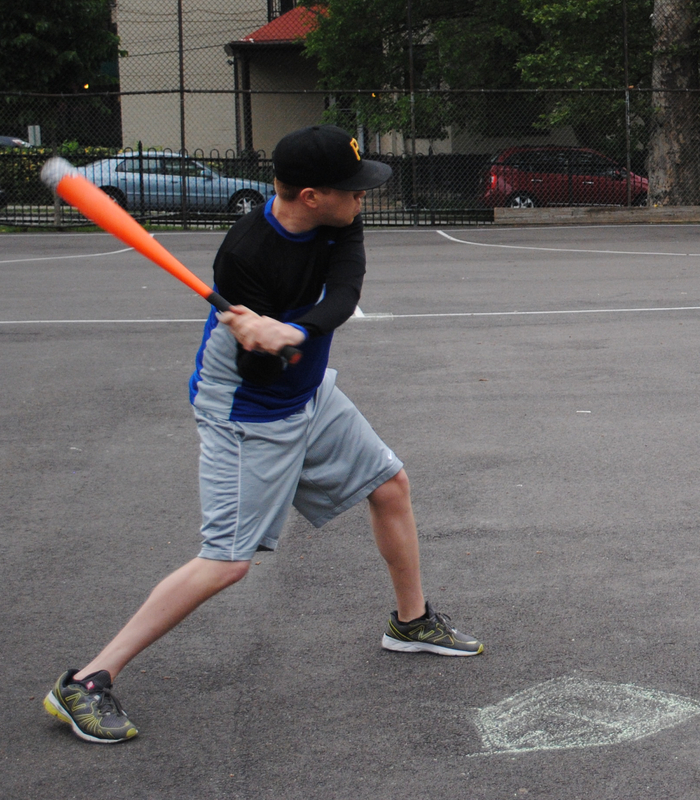 The Ham Slams bounced back in the top of the second, taking the lead from Cookies. Dinger retired Dan to start the inning, and then he got into trouble. Alan hit a solo homer to make the score 3-1, and after a Steve double, Tim crushed a two-run shot to right, tying the game at 3-3. Adam followed with a triple, and Dan drove him in with a two-run homer, putting the Slams ahead 5-3. Dinger retired the next batter, Alan, but the lead had been surrendered. Fortunately for Dinger, the Cookies offense would reclaim the lead in a big way in the bottom of the second. Blose led off the inning with a homer, pulling Cookies within a run at 5-4. Dinger singled, and two batters later Joey doubled to put runners on second and third. Blose then crushed a three-run blast, his second homer of the inning, which put Cookies ahead 7-5. Dinger and Vassallo each followed with singles, and with runners on the corners, Joey hit a three-run homer, extending the lead to 10-5. Blose then doubled, but Charlie avoided further damage by retiring Dinger to end the inning. Down five runs, the Slams would narrow the margin in the top of the third. Steve led off the inning with a single, and Tim followed with his second homer of the game, a two-run blast which made the score 10-7. Cookies then removed Dinger from the mound, bringing in Vassallo for relief. He retired the first two batters he faced to end the inning. After scoring seven runs in the second, Cookies would do it again in the third, piling seven more runs on the Ham Slams. 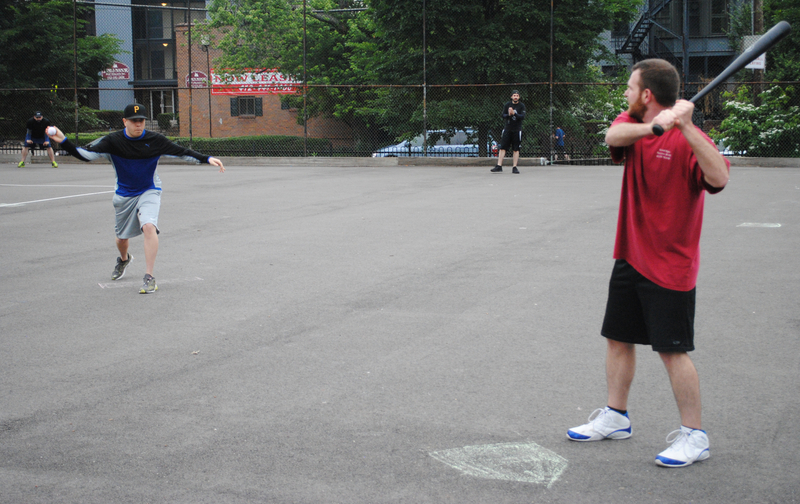 Tim replaced Charlie on the mound, and he didn’t fare much better. Vassallo started the inning with a double and scored when Joey followed with a double, making the score 11-7. Blose then hit an RBI double, followed by Dinger who drove in a run with an RBI single to make the score 13-7. Vassallo then singled to put runnres on the corners, and Joey drove in a run on a groundout to extend the lead to 14-7. Blose then followed with a two-run blast, and Cookies led 16-7. Dinger then doubled, and Vassallo drove him in with a double, his second of the inning, to put Cookies ahead 17-7. Tim finally escaped the inning by retiring Joey, but Cookies had claimed a ten-run lead after three innings. The Slams showed resilience in the top of the fourth, cutting into the Cookies lead a few runs at a time. Alan led off the inning with his second home run of the game, a solo shot that made the score 17-8. Steve followed with a homer, and the back-to-back jacks made the score 17-9. Two batters later, Adam hit the Slams third homer of the inning, a one-out solo homer that cut the score to 17-10. Dan followed with a triple, but Vassallo retired the next batter to end the inning and the rally. Cookies & Cream had scored 14 runs over the past two innings, but they weren’t finished. Blose led off the inning with a single and moved from first to third on a Dinger double. 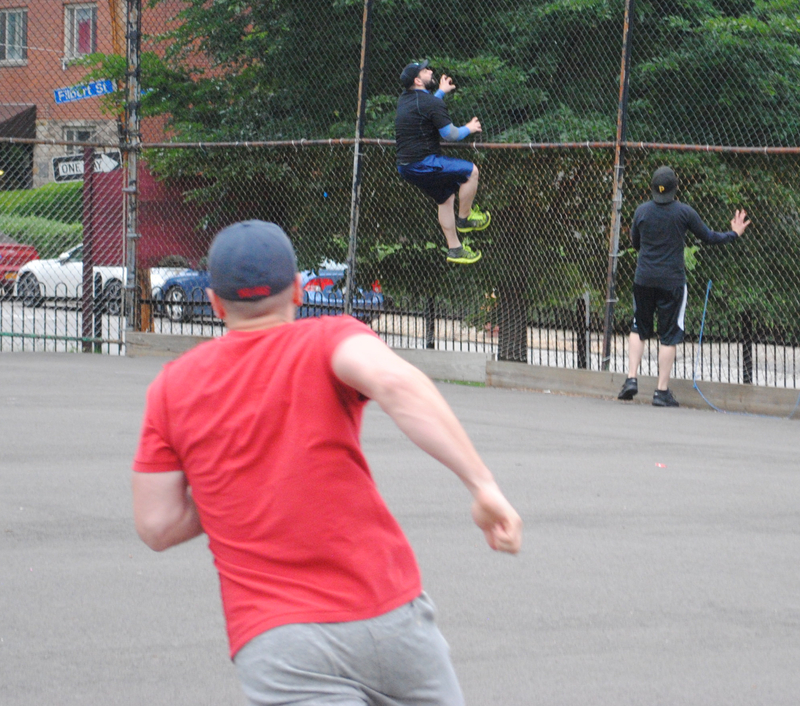 Vassallo then doubled off the fence, scoring both runners to give Cookies a 19-10 lead. Joey followed with a two-run homer, his third blast of the game, and the score was 21-10. Tim retired the next two batters to end the inning, and the Slams trailed by eleven through four. Blose took the mound in relief for Cookies in the top of the fifth, and after giving up a one-out triple to Tim, he stranded the runner to end the inning and maintain the big lead. Tim finally got back on track in the bottom of the fifth, producing his first perfect frame by retiring the side in order. Down 21-10, the Ham Slams needed eleven runs in the top of the sixth to extend the game. Blose retired the first batter of the inning before the Slams started to rally. Alan and Steve each singled, and Tim followed with an RBI single that cleared the bases to make the score 21-12. 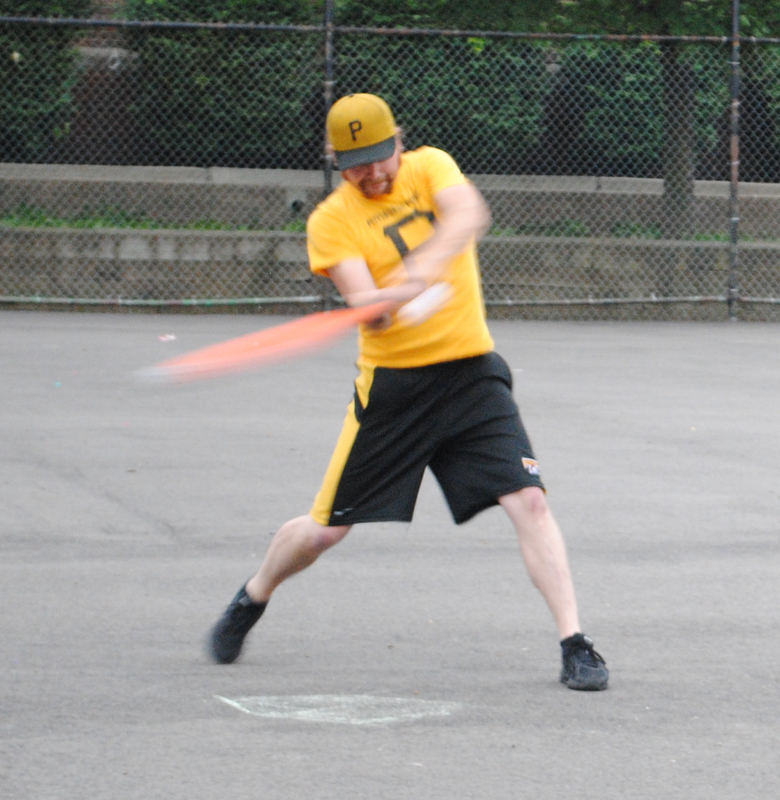 Adam followed with a two-run bomb, his second homer of the game, and the Slams trailed 21-14. 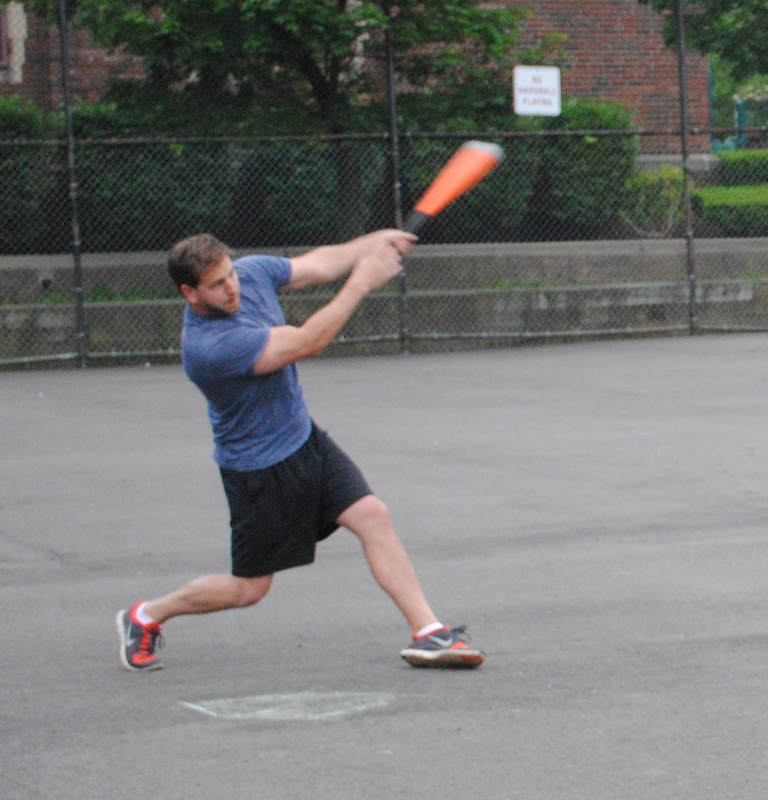 The rally would end there, however, as Blose got Dan to groundout to left to end the longest game in wiffle history. The win moved Cookies & Cream to 5-4 on the year, while the loss dropped the Ham Slams to 1-9 heading into the regular season’s midway point. – Dinger picked up the win for Cookies & Cream, giving up 7 earned runs on 7 hits in 2 innings pitched. – Vassallo pitched two innings of relief for Cookies, allowing 3 runs on 4 hits in 2 innings. Blose also pitched 2 innings of relief, surrendering 4 runs on 5 hits. 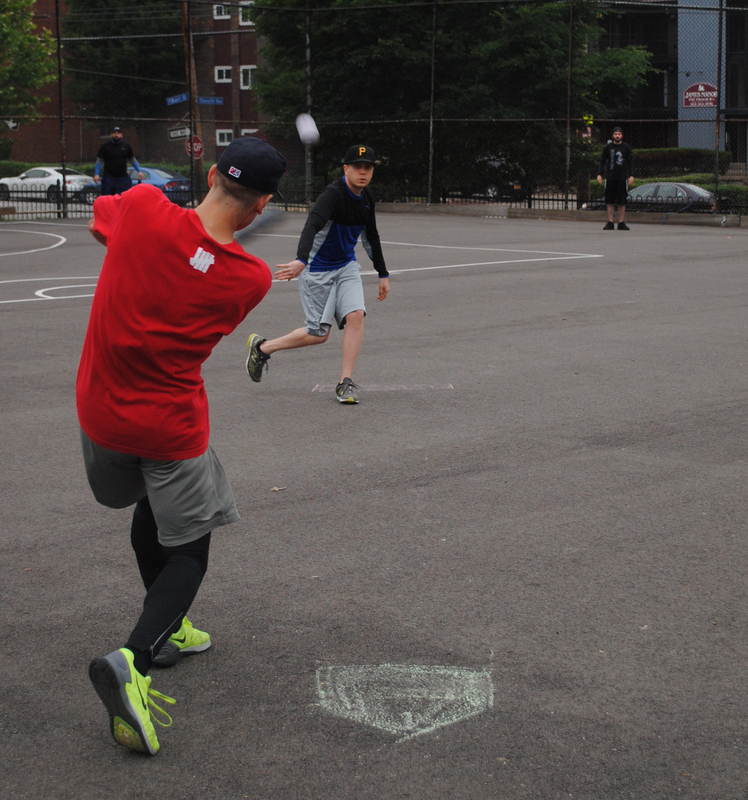 – Charlie took the loss for the Ham Slams, giving up 10 runs on 11 hits in 2 innings pitched. Tim pithced 3 innings of relief, allowing 11 runs on 12 hits. – Every player for Cookies & Cream had a stellar day at the plate. Joey led the way and went 5-for-9 with 2 doubles, 3 homers, 5 runs scored and 8 RBI. – Blose went 6-for-8 with a single, 2 doubles, 3 home runs, 5 runs scored, and 7 RBI. – Vassallo went 6-for-8 with 2 singles, 3 doubles, a home run, 5 runs scored, and 4 RBI. – Dinger went 6-for-8 with 3 singles, 2 doubles, a homer, 6 runs scored, and 2 RBI. – Tim led the Ham Slams on offense, going 4-for-6 with a single, a triple, 2 home runs, 3 runs scored, and 6 RBI.